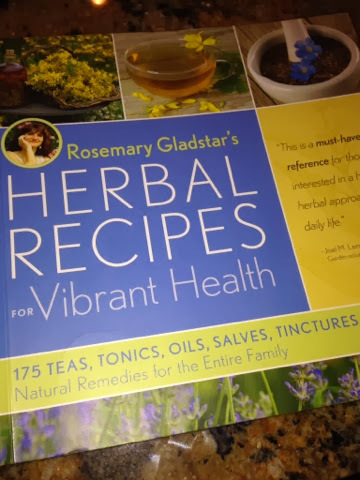 I purchased this book from Amazon (Prime is another of my favorite things!) and have enjoyed trying things from it. This is where my recipe came from. It’s official name is Bottoms-Up Salve but I call Baby’s Bottom Balm. Not only is it good for the diaper area but also for all kinds of cuts and scrapes. Place herbs in olive oil in 1 quart jar. Swirl around to cover. Place lid on jar and place in a sunny window for 2 weeks. This is called solar infusing. At the end of the two (-ish) weeks, warm jar in pan filled with water heating on low on stove. I put a wash rag in between jar and pan to prevent rocking. Let warm for 1 hour. Strain off oil and measure. For each cup of oil, add 1/4 cup grated beeswax. I am too lazy to grate and buy the pastilles from Mountain Rose Herbs! I also add 2 or so tablespoons of coconut oil now. 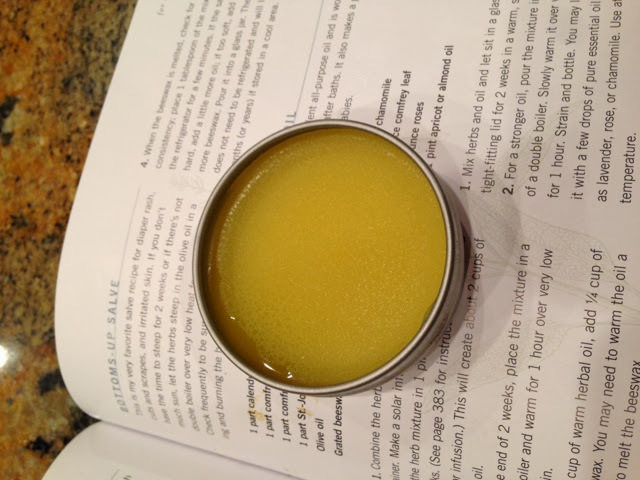 Stir to melt both beeswax and coconut oil. Pour into tins or class containers and let cool before moving. You could half recipe but I just make a big batch at one time. I have several Ball canning jars that are devoted for herb use only. And some mixture is always infusing in my window.